Nature is full of fibrous structures, such as wool, silk, and spider webs from the animal world and cotton, linen, and bamboo from the plant world. These fibrous materials perform special functions not available from bulk materials. If the diameter of the fibers is in the tens or hundreds of nanometers, we enter the world of nanofibers. Nanofibers, whether natural or synthetic, belong to nanomaterials and possess new material properties and functions due to the unique shape and size of the fibers and the myriad of ways these fibers are assembled. Some advantages of nanofibers are a high surface area (1 – 100 m2/g), high porosity (ca 90%), small diameter (10 nm – 1 mm), and a small, interconnected pore size. These unique features make nanofibers useful in numerous diverse application areas, such as filtration, catalyst, sensor, tissue engineering, and energy storage. Several methods are used to make nanofibers: template, self-assemble, phase-separation, melt-blowing, and electrospinning. Among these, electrospinning is deemed the most promising due to its ability to produce continuous nanofibers on a large scale and adjustable fiber structures from a variety of electrospinnable polymers. Figure 1: The electrospinning process. Several review articles have summarized progress in electrospinning,,, which has become a well-established method to produce non-woven fibrous webs of polymeric materials from relatively dilute solutions. 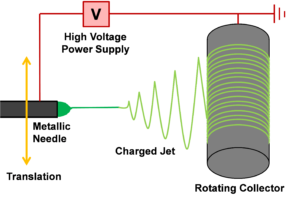 In the electrospinning technique, a polymer solution is fed through a needle charged to a high electrical potential, typically 10 kV or higher, relative to a grounded collector. This collector can be a solid metal plate, a metal screen, or a metal drum which allows current drainage via electrical conduction. Because of injected charges that accumulate on the elongated solution front at the needle, repulsive electrical forces overwhelm surface tension and stretch the jet as it accelerates toward the electrical ground. Due to the interaction between the jet and external electric field and charge repulsion inside the jet, the charged jet undergoes whipping instability to further stretch it thinner. In the meantime, the solvent evaporates and the entanglements of the polymer chains prevent the jet from breaking up, resulting in fine fibers, generally 0.1 – 5 µm, randomly collected as nonwoven on the substrate. A schematic of this process is shown in Figure 1. 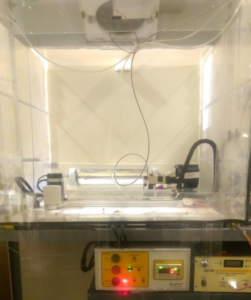 Figure 2: Electrospinning setup at NEI. At NEI, we have an electrospinning setup (Figure 2) for producing a variety of (nano) fiber related structures. Over the years, we have developed the capability to produce multi-scale, multi-functional, nanoscale and micron-sized fibers. We can incorporate nanoparticles into electrospun fibers, produce core-sheath fibers, and fabricate composites of electrospun fibers embedded in polymer matrix composites. The nanofiber morphology is governed by various parameters which are classified into three categories: solution parameters, process parameters, and ambient parameters. The polymer structure and the solvent or solvent combination, polymer molecular weight and polymer concentration determine the basic solution properties such as viscosity, surface tension, and conductivity, all of which strongly influence the electrospinning process. Process parameters include voltage and tip to collector distance, which together determine the applied electrical field strength, feeding rate, rotation speed of the rolling collector, and emitter slider moving speed. Ambient temperature, humidity, solution temperature, and air flow rate are the ambient parameters that can influence the electrospinning process. The interplay of all these parameters determines the final morphologies of the electrospun fiber mat, which are unique to electrospinning and not seen in nanostructures produced by other techniques. Some salient structural features of the nanofiber mat are summarized here. The most crucial determining factor of fiber diameter is solution concentration. An increase in solution concentration results in increased diameter of the fiber provided the viscosity of the solution is not so high that the solution becomes un-spinnable. In highly concentrated solutions, a secondary fiber with smaller diameters has been observed, producing a bimodal distribution of fiber diameters. The electrical voltage is another parameter that affects fiber diameter. With the increase of electrical voltage, increased and decreased fiber diameters have both been reported, depending on the polymer system. Increasing the solution conductivity by adding salts leads to a smaller diameter because of increased elongation forces due to a higher charge density. 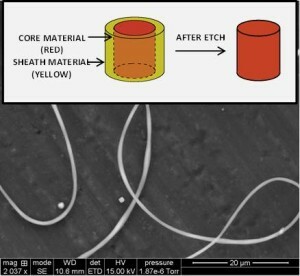 Figure 3: Presence of beads in a core-sheath electrospun fiber mat with a PAN sheath and a liquid core. Fiber diameter is not always uniform; beading is a common occurrence. Although often deemed as an imperfection and to be avoided, beading can become desirable in special cases. Figure 3 shows the presence of beads in a core-sheath electrospun fiber mat (fabricated at NEI) with a PAN sheath and a liquid core. Besides beading, a porous surface structure on individual fibers has been reported for polystyrene fibers. The cross-section of electrospun fibers is usually circular. However, in some cases where high molecular weight polymer is used in high concentration, the high viscosity of the solution reduces the solvent evaporation rate, resulting in wet fibers dashing onto the collector and collapsing into flattened ribbon-like nanofibers. Normally, the electrospun nanofibers are randomly collected, which gives the fiber mat a random, nonwoven structure. Fiber alignment can be achieved by one of three methods. In the first method, fibers are collected on a cylindrical drum rotated at high speed. Highly aligned PLLA fibers are obtained when electrospun at 1,000 rpm. In the second method, the fibers align themselves across an insulating gap in the substrate. The third method utilizes electrical or magnetic fields around the electrospun jet. Many applications require a porous structure of the nanofiber mat. Electrospun fiber mats have a high surface area to volume ratio because of the fine fiber diameter compared to fiber mats produced by traditional fiber fabrication techniques, such as extrusion. The pores are formed by an entanglement of the electrospun fibers and are interconnected to form a three-dimensional porous network. The porous structure can be described by pore size, which determines the type of substance that can permeate through, and porosity, which is a measure of the void space in the electrospun fiber mat. For fibers that have a secondary structure on their surfaces, pores within each fiber can be found. Coaxial electrospinning is an innovative extension of electrospinning and can be used to fabricate polymer nanofibers with unique core–sheath or hollow structures, which impart multiple functions. A dual channel spinneret carrying unmixed core and sheath materials is used to create a core sheath fiber structure, similar to that of a drinking straw. The same electrospinning parameters control the morphology of the core-sheath fiber mat as that of conventional electrospinning, with the added complication of interface interaction of the phases and the different individual physical behavior of each phase. Figure 4 shows the core sheath fiber structure and the TEM of a core-sheath fiber fabricated at NEI containing a polymer shell reinforced with CNT and a liquid core. Figure 4: (a) Core-sheath fibers are used to combine properties of different materials, such as adding strength or providing encapsulation for a weaker core material; (b) Transmission Electron Microscopy of a core-sheath fiber fabricated at NEI with carbon nanotubes (CNTs) located in the sheath. The dark contrast is due to CNTs. 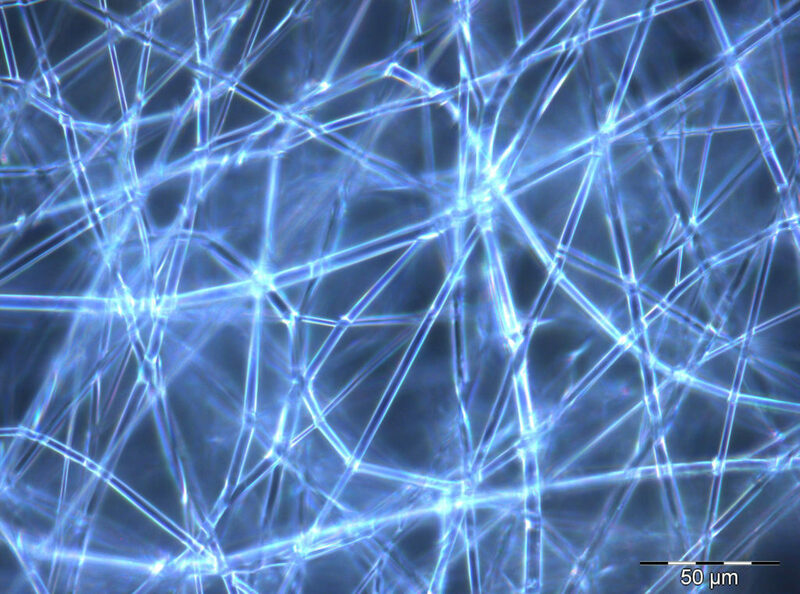 Electrospun nanofibers are usually collected on metallic substrates such as aluminum foils. Thick enough electrospun materials can be peeled off from the substrates as free standing fiber mats. Depending upon the application, electrospun fiber mats can also be collected on metal mesh fabrics and thin porous polymer membranes. 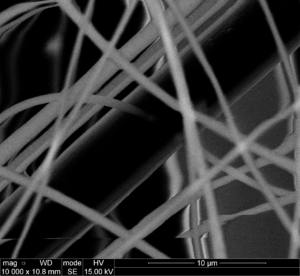 Figure 5 shows an example of polyacrylamide (PAN) fibers electrospun onto splayed carbon fibers (fabricated at NEI). Figure 5: PAN fibers deposited onto the splayed carbon fibers. Electrospun nanofiber meshes are excellent filtration membranes due to their high porosity, interconnectivity, micron/submicron interstitial space, and a large surface to volume ratio. These have been used in waste water treatment and particle removal from air. Electrospun fiber mats are also used to collect metal ions from water resources, and its adsorption capability can be improved by fiber surface modification. Electrospun nanofibers also show promise for sensor applications thanks to their high surface area. Nanofibers functionalized with MoO3, SnO2, or TiO2 exhibit an electrical resistivity that is sensitive to pollutants, such as ammonia and nitroxide. Nylon-6 nanofiber was functionalized with biotinylated glucose oxidase for testing glucose concentration. Tissue engineering is an emerging and interdisciplinary field which involves the use of living cells to improve or replace biological tissues. Electrospun nanofibers have been intensively investigated as a scaffold material for tissue engineering. A scaffold needs to possess a high degree of porosity, a large surface area, biocompatibility, and structural integrity to prevent pores from collapsing during neo-tissue formation. Electrospun nanofiber scaffolds have demonstrated great performance in cell attachment, proliferation and penetration, through both in vitro and in vivo trials, among all biomedical materials under evaluation. In order to meet today’s ever increasing demand for curtailing carbon footprints, materials with enhanced properties that enable higher efficiencies in energy conversion, harvesting, and storage are in increasing demand. Energy related technologies – including lithium ion batteries, fuel cells, capacitors, and photovoltaic cells – can significantly lower energy-related carbon footprints and decrease dependence on fossil fuels. Electrospun nanofibers find applications in these areas for their high porosity and inherent large total surface area. 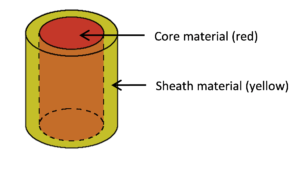 An example is given here on applications of electrospun nanofibers in lithium-ion batteries. Traditional lithium-ion batteries are composed of powdery cathode materials mixed with carbon, a porous polyolefin separator immersed in a liquid electrolyte, and a carbon anode. Electrospun nanofibers can be used in all three layers to enhance the overall battery performance, including large capacity, high charge / discharge rate capability, and extended cycle life. Compared with powdery electrode materials, electrospun nanofibers have a shorter diffusion path and faster intercalation kinetics thanks to their high surface area/volume ratio. More lithium insertion sites are available on the nanofiber electrodes, which would decrease the charge transfer resistance at the electrode/electrolyte interface. Electrospun nanofiber mesh is also advantageous to polymer separators based on polyolefin because of its smaller pore size and larger porosity. As an example of electrospun nanofibers being used as an anode, a Si/C nanofiber anode was fabricated by electrospinning. Si has been intensively studied as a replacement anode material to carbon because of its enormous theoretical charge capacity (4200 mAh g−1). However, Si has a serious drawback in that the brittle material cannot withstand the large volume change during lithium insertion and extraction. The Si/C nanofiber electrode significantly improves performance by supporting Si in a conductive C network. Si nanoparticles were first dispersed into a carbon precursor polymer (PAN) solution and the dispersion was electrospun into a Si/PAN fiber mat, which was later converted to a Si/C fiber mat through heat treatment. The Si/C nanofiber anode made from 15 wt. % Si/PAN precursor demonstrated a specific charge capacity of approximately 1100 mAh g−1 and discharge capacity of 880 mAh g−1. A nanofiber cathode was constructed by electrospinning LiCoO2 nanoparticles, carbon powder, and poly(vinylidene fluoride). The fibers had a high LiCoO2 particle content (70 wt. %). Full cells containing a LiCoO2/C/PVDF fiber mat cathode and C/PVDF fiber mat anode exhibited a high energy density of 144 Wh kg−1 at 0.1 °C and an areal capacity of 1.03 mAh cm−2 at 1 °C. The excellent performance is attributed to electrolyte penetration throughout the 3D fiber electrode mats, a large electrode/electrolyte interfacial area, and short Li+ transport pathways between the electrolyte and active material nanoparticles in the radial fiber direction. A PVDF electrospun nanofiber web was used as a separator for a battery. When combined with 1 M LiN(CF3SO2)2 electrolyte solution, the electrospun PVDF nanofiber web displayed an ionic conductivity of 1.6 – 2.0 × 10−3 S/cm. The electrospun PVDF nanofiber mat was treated with ethylene plasma to allow self-shutting down of the battery in case of a short circuit by melting the polyethylene (PE) layer grafted on the PVDF nanofibers. Electrospinning is a versatile technique for transforming a wide range of polymers and ceramics into fiber structures. 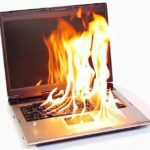 Almost any polymer that can be dissolved in a solvent or melted at a reasonably low temperature can be electrospun. At NEI, we have electrospun a host of different polymer fibers including polyacrylonitrile (PAN), poly(methyl methacrylate) (PMMA), poly(vinylidene fluoride) (PVDF), Poly(vinylidene fluoride-hexafluoropropylene) (PVdF-HFP), polyamide (Nylon), and polystyrene (PS). Additionally, by electrospinning ceramic precursor solutions and post treating precursor fibers, ceramic fibers can be obtained. New and creative techniques continue to emerge, creating changing fiber morphologies and orientations to generate complex architectures. These materials find applications in lithium ion batteries, capacitors, solar cells, fuel cells, and hydrogen storage technologies. NEI has used electrospinning for R&D purposes to help companies produce nanofiber mat for lithium battery applications. We can work with our customers to provide customized electrospinning solutions for specific applications. Founded in 1997, NEI Corporation develops, manufactures, and sells nanoscale materials for a broad range of industrial customers around the world. NEI’s products incorporate proprietary nanotechnology and advanced materials science to create significant performance improvements in manufactured goods. NEI’s products include advanced protective coatings, high performance battery electrode materials, and specialty nanoscale materials for diverse applications. NEI has created a strong foundation in the emerging field of nanotechnology that has enabled the company to become a world leader in selected markets. Z. M. Huang, Y. Z. Zhang, M. Kotaki, et al., Compos. Sci. Technol., 63, 2003, 2223-2253. D. Li, Y. N. Xia, Adv. Mater., 16, 2004, 1151-1170. A. Greiner, J. H. Wendorff, Angew. Chem. Int. Ed., 46, 2007, 5670-5703. J. M. Deitzel, J. Kleinmeyer, D. Harris, and N. C. Beck Tan, Polymer, 42, 2001, 261-272. C. L. Casper, J. S. Stephens, N. G. Tassi, D. B. Chase, J. F. Rabolt, 37(2), 2004, 573–578. S. Megelski, J. S. Stephens, D. Bruce Chase, and J. F. Rabolt, Macromolecules, 35(22), 2002, 8456–8466. E. L. Feldman, D. C. Martin, J. Biomed. Mater. Res. A., 83(3), 2007, 636-645. P. I. Gouma, Rev. Adv. Mater. Sci.,5, 2003, 147-154. S. Ramakrishna, K. Fujihara, W.-E. Teo, T. Yong, Z. Ma, and R. Ramaseshan, Materialstoday, 9 (3), 2006, 40-50. J. Fang, X. Wang, and T. Lin, “Functional Applications of Electrospun Nanofibers”, INTECH Open Access Publisher, 2011. X. Zhang, L. Ji, O. Toprakci, Y. Liang, and M. Alcoutlabi, Polymer Reviews, 51 (3), 2011, 239-264. E. Self, E. C. McRen, R. Wycisk, and P. N. Pintauro, Electrochim. Acta, 214, 2016, 139-146. S.-S. Choi, Y. S. Lee, C. W. Joo, S. G. Lee, J. K. Park, K.-S. Han, Electrochim. Acta, 50 (2-3), 2004, 339-343.